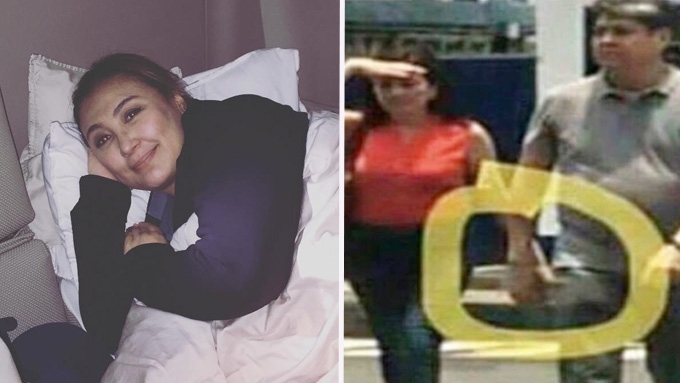 Home / News / Sharon Cuneta reveals real reason why she left for U.S.
Sharon Cuneta reveals real reason why she left for U.S.
Sharon Cuneta took to Facebook today, May 14, to finally squelch rumors about her allegedly shaky marital situation, and revealed the reason why she left for the U.S.: "IT DOES NOT INVOLVE A THIRD PARTY." "There is no truth to the rumours going around that Kiko and Sen. Risa Hontiveros are having an affair (or held hands)." This is what Sharon Cuneta initially cleared in her lengthy post earlier today, May 14, on her official Facebook account. ”Okay. Here is the truth. Kung anuman ang pinagdadaanan ko/namin ngayon, HINDI PO ITO KASALI DOON. There is no truth to the rumours going around that Kiko and Sen. Risa Hontiveros are having an affair (or held hands). Some people are evil. They have nothing better to do than ruin people's lives. Wala bang mas matalino or mas challenging na paraan na hindi naman nakaiinsulto sa utak ng karamihan kung maninira ka rin lang ng kapwa? “Ngayon, after thirty years, nangingibabaw sa akin ang dugo ng Daddy ko. Cuneta ako. We are street-smart. My father had a Master's Degree from the school of hard knocks. Do not even THINK about putting one over me. I shall NEVER allow it again. “So if I am indeed going through anything now, IT DOES NOT INVOLVE A THIRD PARTY. “I hope you are all alright. Don't worry about me. God made me in my Mommy's tummy to be super strong. I know that. Remember what my Daddy said, "Iba ang mabait sa tanga?" That sums it all up. “In the past few weeks I've had two people die on me. A favourite auntie is sick. The start of filming for my movie with Star Cinema has been moved to September. I owe so much money (on very good investments not stupid stuff) and I have NO ONE IN THE WORLD TO HELP ME. I am probably the poorest, most cash-strapped billionaire you know (!). Etc., etc., etc. So much more, and you don't know half of it. So I left Manila. Being somewhere else lets you see things from a whole different perspective. Can't be effective as a mother, wife, sister, aunt, co-worker, friend, etc., etc., etc. if YOU yourself are lost and need to breathe. Siguro naman may karapatan din ako malungkot at mapagod? “I am a human being. I want to rest my mind, body, heart and soul. I am tired of being all things to all people, and I realize no one has really done or been the same for me. I think there are only a few of us who are like that. You know the phrase "Give and take?" Ako si "give," lahat sila halos si "take." I have been taken advantage of, used, abused, pushed to my limits that they should thank God that I am a Christian and have been raised well by my parents otherwise my shooting (not with a camera) and archery skills would have already been put to good use on them. “I should be retired and living off the fruits of my labor now, but instead, I work like a horse when what I should be doing is working only on what I wish to and only when I want to. No one will save me from my concerns, mostly created by other people who, unlike me and some I work with now, call everything wrong "just business." No more Daddy. Only God. And my health and energy and will to work. My family. Friends and fans. These are all and I know for now they are more than enough. I am tired though I love what I do so much. “I have changed inside me. I feel it very much. I still cannot put my finger on it but I now know one thing is that I am no longer taking any b______t from anyone. And I am tired of having to often "act" in real life too when I should be acting only in front of the cameras. It is scary to realise that you have gotten so used to acting like your life is perfect the minute you have an audience, and knowing that you'd rather be on the floor crying. Maybe that's why my laugh over the years has only gotten bigger. I have become an expert at compartmentalising my feelings that I can focus instantly on a topic and let whatever my problem is take a backseat for the moment. That can be a good thing, but again, that scares me. I am tired. More inside than outside. “But I am eternally grateful to God for His unbelievable blessings and am trying my best to be a good steward of them. “This is me. I am open and I don't care. Take me or leave me. I'd rather show my heart than pretend I don't have one. “Thanks so much for your love, support, and encouraging words. Now please don't worry about me na. I am okay. I always am. “Happy Mother's Day to all you mommies out there. “God bless us all and I love you.